Shirdi Sai temple is a beautiful place of pilgrimage that was built over the Samadhi of Shri Sai Baba. Shirdi is accessible via the Ahmednagar - Manmad State Highway No.10, approximately 83 km from Ahmednagar and 15 km from Kopargaon. Shri Sai baba of Shirdi lived between 1838 and 1918 at Shirdi. 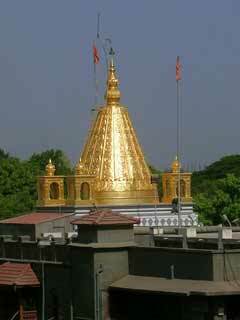 The closest and most highly connected city from Shirdi is Ahmednagar city. Shirdi now has a new railway station called "Sainagar Shirdi", which became operational in March 2009. Trains also run from Manmad railway station which is 87 km and Ahmednagar railway station which is 83 km from the heart of Shirdi, alternatively from Kopargaon station which is 15 km from Shirdi. Buses and taxis ply from these railway stations and locations to and from Shirdi. 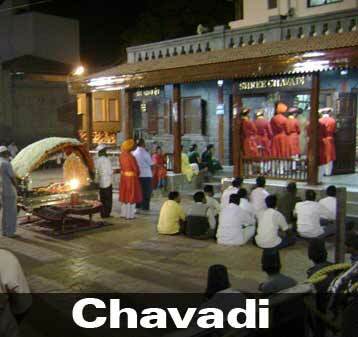 Shirdi can be reached by bus from Ahmednagar, Mumbai, Pune, Thane, Nashik, Akluj, Dhule, Nagpur and Aurangabad. Shirdi Airport is being constructed at Kakdi (Kopargaon taluka), 14 km south-west of Shirdi. 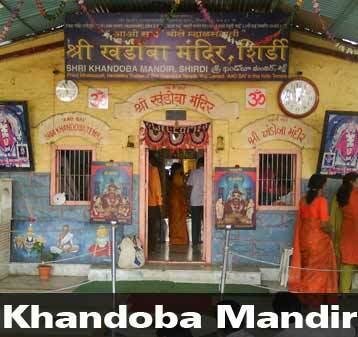 Root for shirdi airport is shirdi - Nandurkhi bk(4 km)- Korhale(8 km)- Kakadi(14 km). The temple grounds of Shri Saibaba are spread in approximately 200 sq. meters. 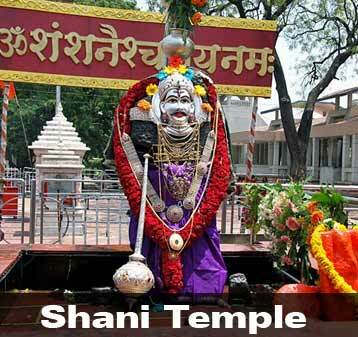 It is located in the heart of Shirdi village and is a major center of pilgrims from all over the world. Sai Baba Shirdi Temple On an average, daily 25,000 devotees visit Shirdi village, to have the Darshan of Shri Saibaba. In the festival period, more than 1,00,000 devotees visit the Temple everyday. The shrine building is renovated in the year 1998-99 and now is equipped with all necessary facilities like Darshan Lane, Prasadalay (Lunch and Dinner), Donation Counters, Prasad Counters, Canteen, Railway Reservation Counter, Book Stall etc. The accommodation facilities are also provided by Shri Saibaba Sansthan Trust. Dwarkamai was the mosque where sai baba stayed at his last breathing . He slept most of night here . 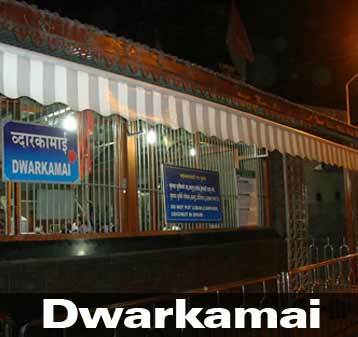 Dwarkamai is situated on the right side of the entrance of Samadhi Mandir. Here. Baba lit up lamps every evening. It was here that Baba spent his days sitting on a huge stone which is preserved till date. Even the sacred dhuni (fire) which was kindled by Baba is lit to till this date. The miraculous udhi (ash) from this fire is used by pilgrims and is considered to be immensely divine. The Masjid has a life-size portrait of Sai Baba which he himself received and said that after me the portrait would continue to live here. The Dwarkamayee Masjid in fact holds more importance for many devotees of Sai for being the place where this pure soul spent his life. There was also has the grinding stone and the wooden vessel called Kolamba in which Baba used to keep the Bhiksha brought from the village. Sai Baba first came to Shirdi at age of 16.He was first spotted seated under a Neem tree. This place came to be known as Gurusthan. 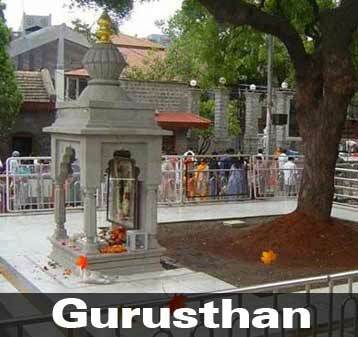 The neem leaves left their bitterness due to the presence of Sri Sai Baba in its shade.The renovation of Gurusthan was made on 30th September, 1941. On the side is a marble statue of Baba. In front of the portrait is a Shivling and the Nandi. Photos of twelve Jyotirlingas are kept in the temple. 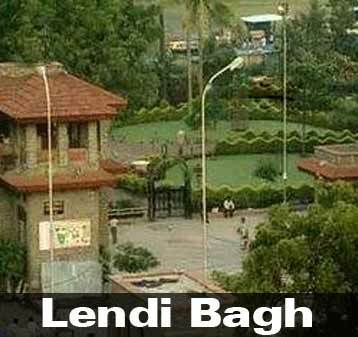 Lendi Bagh is neat from Gurusthan. Lendi Bagh was made by Sai baba and watered daily by him. Sai baba used to visit here and took care of it . he gave it name from At some distance from Gurusthan there is the Lendi Baug. This Bagh was made and watered Nalla (a drain). Baba dug a pit, 2 feet deep, under the Neem tree and kept a Deep lit in that pit. Situated in a row adjacent to each other are these three temples which happen to be few of the oldest temples of Shirdi. These three temples of Shirdi are greatly revered and hence visited by a number of devout Hindus on their visit to Shirdi.